Product #21121 | SKU IQ6 | 0.0 (no ratings yet) Thanks for your rating! The iQ6 Stereo X/Y Microphone from Zoom turns your iOS device with Lightning connector into a field recorder for capturing the sounds of concerts, interviews, meetings, lectures and more, at up to 16-bit/48kHz resolution. The microphone uses the same two, high-quality, unidirectional condenser mics found in the popular H4n recorder, allowing your recordings to cover a wide area, while still capturing sound sources in the centre with clarity and definition. The X/Y microphones can be set at two different angles, 90 degrees for a tightly focused image, or 120 degrees for a more immersive wide-angle stereo. The input gain can be adjusted using the large, mic gain wheel on the front of the unit, while you monitor your levels using the 3-segment LED. 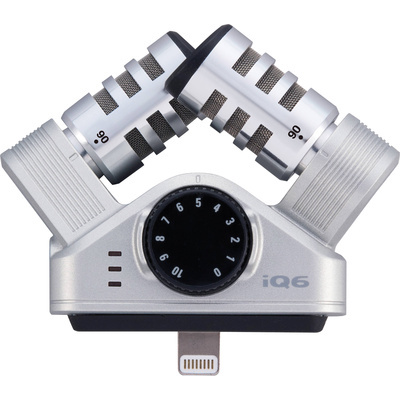 The iQ6 also features a dedicated 3.5mm headphone jack, enabling direct monitoring during both recording and playback. The headphone output can also be used as a line out for making a backup recording if desired. The iQ6 comes with a removable spacer that allows it to be used with most iPhone, iPad, and iPod cases. The mic is compatible with Zoom's free Handy Recorder app, which gives you the option to record as PCM or AAC files, and offers effects such as compression, AEQ, and reverb. Additionally, it will work with Apple's Voice Memo app and GarageBand, as well as most apps that support input from an external microphone. Zoom's Handy Recorder app, available for free from the iTunes App Store, provides an assortment of tools for your iQ6 and iOS device. In addition to offering onscreen level metering, it enables you to set the iQ6 headphone volume, as well as adding an automatic recording function-handy for capturing the sound of meetings, speeches, and other situations. Choose linear PCM format for the highest quality sound or AAC format to conserve storage space, then apply compression, AEQ and reverb effects to your recordings. Handy Recorder even allows you to email your files to friends and to upload them to SoundCloud for sharing with the world.